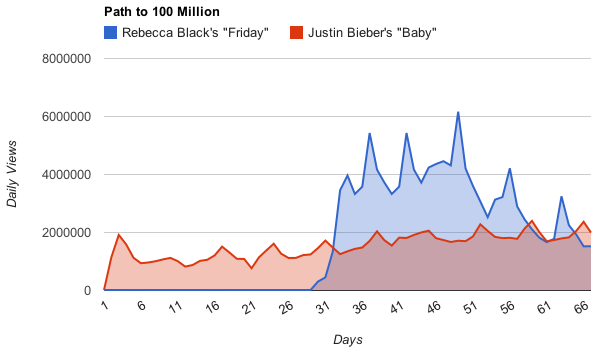 Rebecca Black's "Friday" video officially crossed the 100 million view mark this week. The video, which was posted in February, really took off in March, roughly a mere one month ago. There are numerous other iconic viral videos that have never even hit the 100 million mark, like "Bed Intruder" or "David After Dentist." As we mentioned previously, Black's video exists as both a standard viral clip and a music video with some staying power, which could account for its longer tail, though it's hard to imagine it could catch Bieber's 561 million total. What Will March's Biggest Trend Be?